If there is one thing I always, always talk about when meeting new people, it’s Pierogi Fest®. Taking place in my hometown of Whiting, Indiana, Pierogi Fest® draws around a quarter of a million people at the end of each July as it celebrates Eastern European food and culture with a wacky, familial twist. Pierogi Fest® is organized by the Whiting-Robertsdale Chamber of Commerce, a non-profit organization in Whiting that helps promote and engage local businesses. The original Pierogi Fest® website. 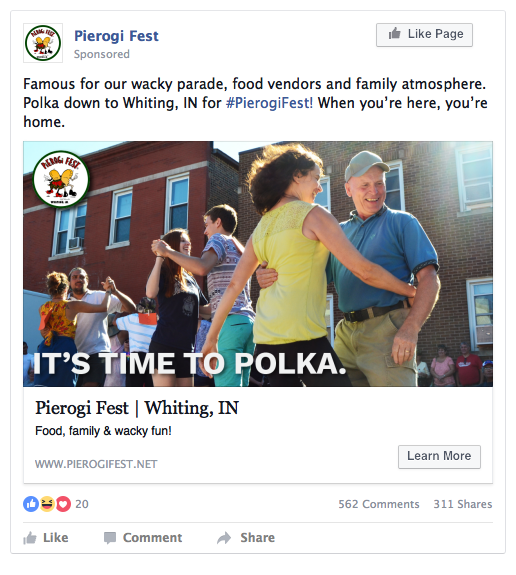 Pierogi Fest® has been held for almost 25 years, but it’s presence in the digital landscape was almost non existent. It had a website and Facebook page that was updated sparingly, but it was not built to evolve in the new digital landscape and it didn’t house the necessary informational content it needed to. There was no presence on Instagram or Twitter, two mediums that the fest desperately needed to break into. To get started, I proposed the formation of the Pierogi Fest® Digital Experience Team, which encompasses both web and social media efforts. The first Pierogi Fest® app. This app was built on App Press, an Indianapolis based app and software development company. In the first year, I designed a native app for Pierogi Fest® and it was a good solution to start. But we soon found many problems. The original app and coinciding social media marketing materials had a cohesive style, but it was just that: a style. It lacked a solid brand. The overarching Pierogi Fest® dancing pierogi logo was there, but digitally, there didn’t seem to be cross platform connection. The style created was a nod to the festival signage that’s been used for over 20 years, but that was the only real connection this style had to the fest. Additionally, one of the major problems was access to the app during Pierogi Fest®. We realized that people probably weren't going to want to download an app just for a couple days, especially if their phones had issues with storage space. Having a more mobile-first website would allow easier access to information during the fest. Read a recap of the first digital efforts with the native app here, and a documentation on our reasoning for transitioning to a mobile-first website here. 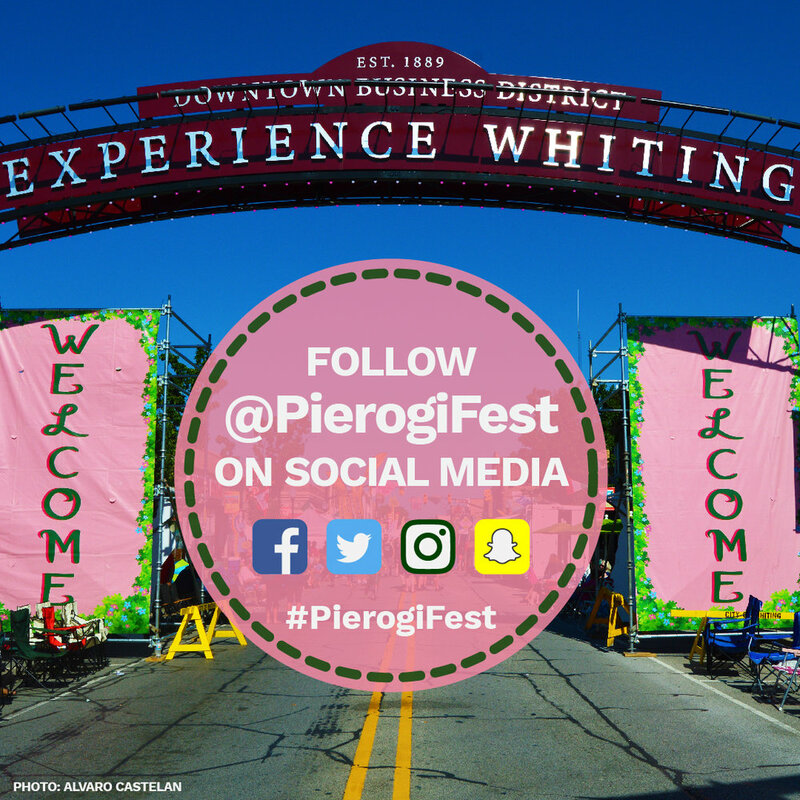 Pierogi Fest® initially only had a Facebook page, so the first step to create a more robust social media presence was to get the fest on both Instagram, Twitter and Snapchat. After, I created a content calendar to write and schedule posts and organize visual elements such as photos, videos, gifs, marketing materials and geofilters. Additionally, I put together and managed a team of six people who worked the three days of the fest round the clock gathering and editing content, covering entertainment events on Snapchat and Instagram and managing the online social community. The first redesigned Pierogi Fest® website was designed on Webflow. 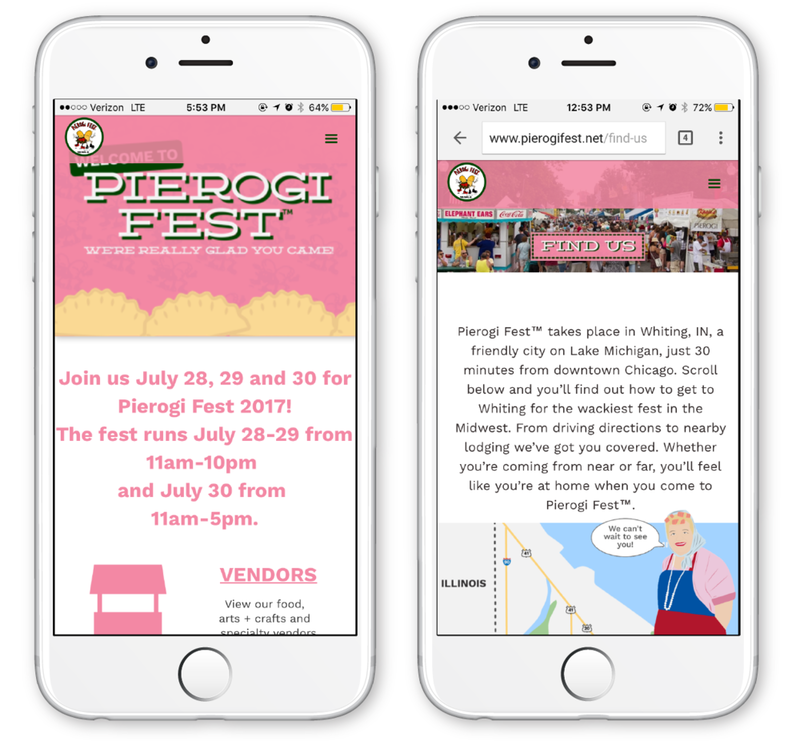 The newly redesigned and mobile first Pierogi Fest® website was launched in May 2017, and within its first 24 hours of launch, unique visits were already double the original 1,400 app downloads. On the social side, we added an additional 5K organic followers on Facebook, and broke the 500-700 organic follower mark on Twitter and Instagram. Our custom geofilters on Snapchat gained 350.7K impressions and were used over 5K times. In 2017, the Facebook live stream of the annual Polka Parade received over 14K views across the Midwest. The social media team started the hashtag campaign #BehindTheTents to spotlight local businesses in Whiting during Pierogi Fest®. The final updated Pierogi Fest® website, built and managed on Squarespace. For the 2018 Pierogi Fest, the website got a final upgrade. This upgrade was initiated to promote ease of use for updating by the WRCC. This upgrade transitioned the website to the Squarespace platform, but allowed brand retention across the move. 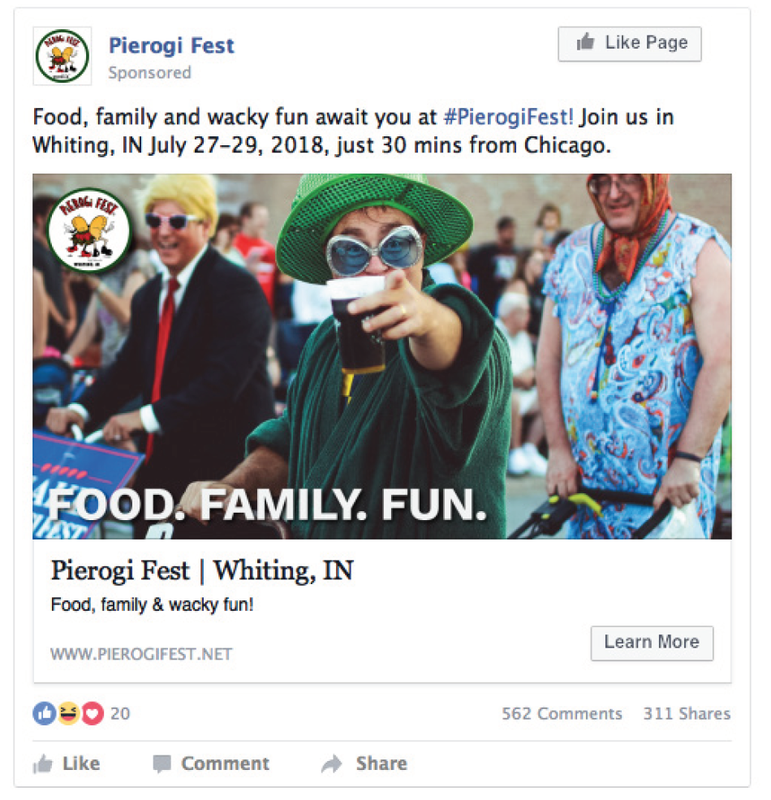 On the social side, Pierogi Fest® has kept upping its organic follow counts and has a more story-focused approach to content creation and brand development. 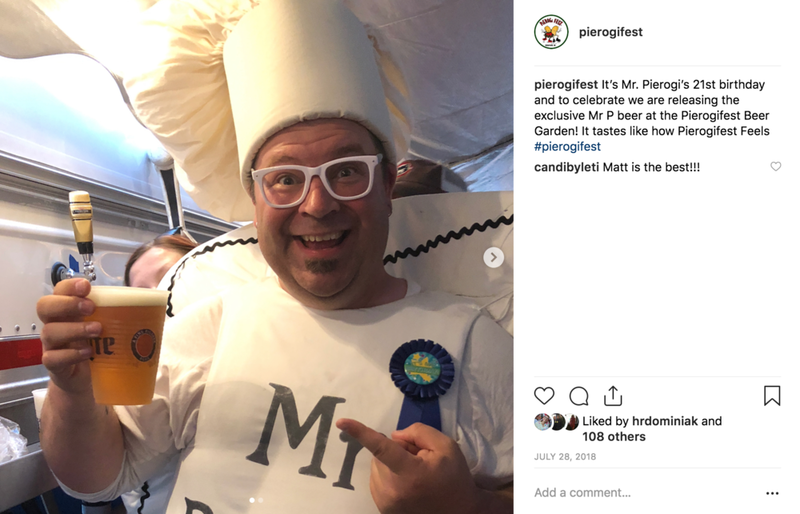 Check out some of my Pierogi Fest® social media work below (and its evolution between fests), and follow Pierogi Fest® on Facebook, Twitter and Instagram for more content. 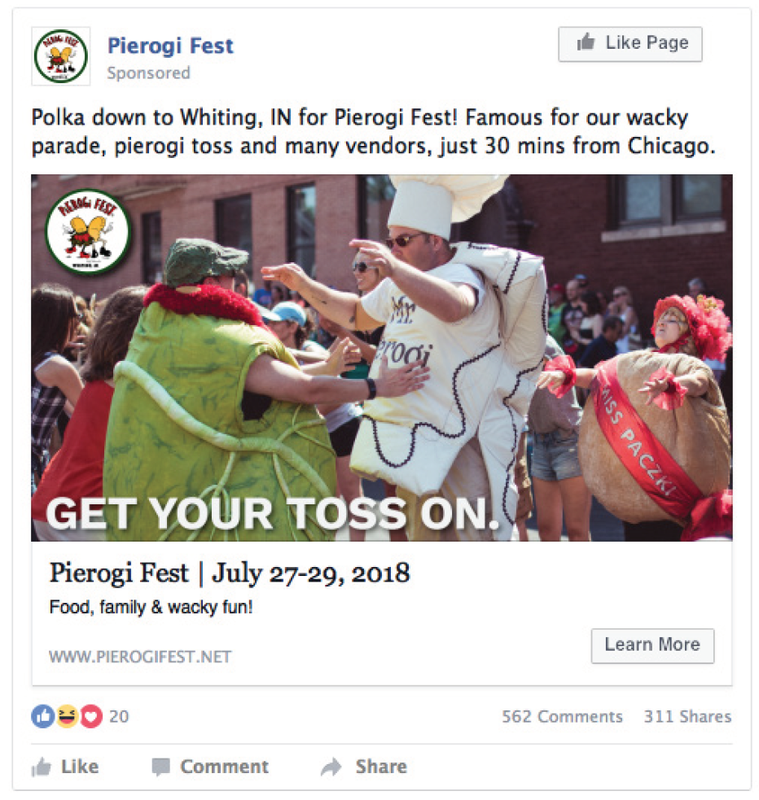 In 2018, the Pierogi Fest marketing committee teamed up with a small agency to implement the first-ever digital campaign. This campaign runs in July 2018, and will include digital banners, paid social on Facebook and an episodic digital billboard. It is an estimated 1,350,000 impressions for the digital campaign, and 340K impressions for the digital billboard. Click each banner to view in full. 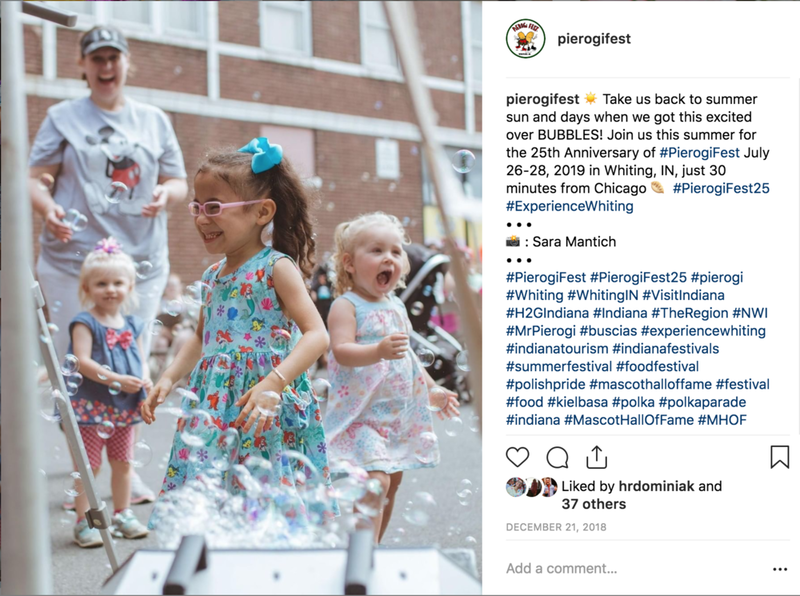 Want to see a full recap of the 2018 social media efforts for Pierogi Fest along with first ideas for our 25th Anniversary in 2019? Click here.